For hikers that are a little more experienced, Triple Falls is fantastic. 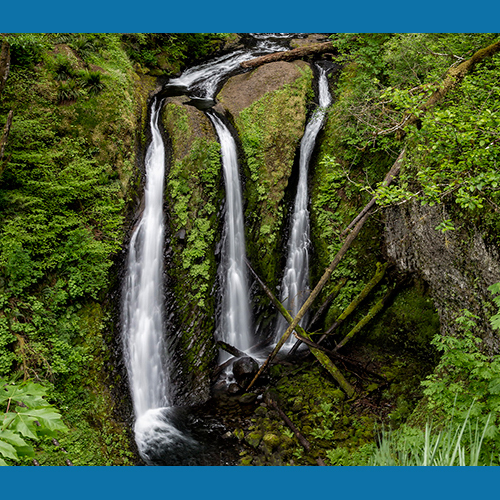 with beautiful waterfall views and green forests the Northwest is known for, it is a great way to spend a day. Start at the Oneonta Trailhead, as it parallels the old highway. Switchback and gain a couple hundred feet until the trail flattens out, coming to a junction with Horsetail Falls Trail (#438). Take a short jaunt down the Horsetail Falls Trail to see Middle Oneonta Falls and the first Oneonta Creek Bridge. After returning back on the Oneonta Trail (#424), climb to a pair of switchbacks as it traverses high above Middle Oneonta Falls (also known as Upper Oneonta Falls). Find a short, steep, and rocky path down to the falls from the main trail, just below the switchbacks. For a longer hike, continue on the Oneonta Trail above the falls another 6.5 miles to Larch Mountain.